Haywards Heath boasts an enviable selection of drinking establishments in the pub AND bar style. The surrounding villages cater for the traditional drinker wanting the more right of centre atmosphere, while the Broadway offers a fine selection of trend bars full of the more racy type of lady. Haywards Heath truly comes alive at night and with more and more trend bars opening the town is rapidly becoming the home of the night owl. So how should you start your evening and where should you go for chic yet bohemian entertainment? Come with us as we take you on an after dark tour of Haywards Heath's glittering nightspots. With no nightclubs on offer the night will be one of steamy bars and smoky pubs. That only means one place these days, the Broadway. Before you embark on a session of any kind it's always a sensible idea to have some food because frankly if you drink on a empty stomach you're asking for trouble. When Sade sang 'Smooth Operator' she didn't base her lyrics on a bloke she saw spewing 10 pints of Newcastle Brown into the gutter so save the Kebab for later and head straight for Zizzis. If it's good enough for Jordan and Pete, it's good enough for you. It's also located at the top of 'The Strip'. After a sublime meal of penne provocante-bestia, it's on to the Star for the first drink of the evening and possibly a light smoke with new friends. Ladies, you may want to miss the Star and leave the men to their men talk. Try Cafe Rouge for a reasonably priced spritzer. Maybe we'll catch up later, if you play your cards right. On the top of the Haywards Heath pub Christmas tree sits The Star. Located within the one way system it is perfect for the car enthusiast. The has undergone several refurbishments in its time. 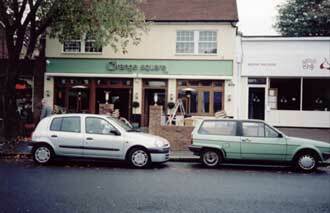 At one stage the pub appeared to sell poncy coffee alongside regular alcoholic beverages. The Star has now returned to its pub roots and even has bouncers. 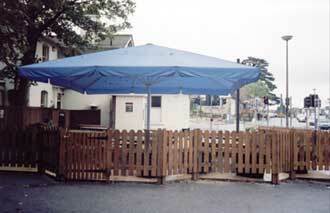 The pub garden in the car park features a large umbrella which we understand to be the largest in the free world. Car parking is for staff only. In spite of the failure of 'Down at 49's', entrepreneurs opened a London style trend bar next to the chemist on the Broadway. Christened Orange Square and stocking a wide selection of bottled lifestyle beverages, the bar has been a runaway success attracting only the cream of the 18-30 age bracket; unlike 'Down at 49's' where only the staff were over 18. Though the same colour as the bar's sign, we don't believe the VW Polo to be an official Orange Square promotional vehicle. Orange Square spawned 2 additional trend bars, Bar Boo! and Evolution. Bar Boo! has a glass front so passers by can see you being a trend. Bar Boo! is often filled to the rafters with good time girls who like blue drinks and seem to enjoy the attentions of men in untucked shirts. With its bare floor boards and leather seating, Evolution (recently renamed EVO and now part of the Orange Square empire) has more of an exclusive London feel. Many patrons sport expensive city fashion labels like Candar, Clock House and Avanti. Evolution also shows Sky television broadcasts and can serve premium nut selections on request. The Broadway is rapidly becoming Haywards Heath's answer to London's Covent Garden minus the jesters and tramps. Located off the beaten track next to fishing supplies centre Sporting Chance, is Penny Lane so called because inside its orange and not green. Orange Square is also orange inside but this is due to light reflecting of everyones tans. Penny Lane traditionally entertains a younger clientele although a strict over 18s and no dirty trainers policy has helped weed out the illicit teenage drinker. They have a signed photo of Leslie Joseph on the wall, a PA system used for live music perfomances and a ventillation problem when everyone smokes. You may not smoke over the pool table. With the closure of the Sussex pub, most of the town's thugs have been herded like fighting cattle who smoke fags into other establishments. The Heath and the Duck have absorbed the overspill so go there if you want a lively discussion about the topics of the day. The Burrell, located near the station, is very popular with commuters. It has TWO televisions, a fruit machine, quiz machine, dart board and pool table. Cues and chalk are provided for patrons who wish to fight. With the curry house next door, the Burrel is the ideal place to begin the classic English night out of beer and spicy food. Lindfield is by far the most popular alternative to Haywards Heath for the drinker looking for a more traditional alcoholic experience or for youths unable to get into Orange Square. The Witch is owned by a former professional footballer and the bar is decorated with football jerseys from the 1970's. It also attracts the younger clientele and appears to be the pub of choice for students of Haywards Heath Sixth Form College. Very much in the way the Linden Tree was some years ago. Other pubs of note in Lindfield are the Bent Arms, and The Red Lion. The Bent Arms was once a haven for rockers and metal-heads in the late 80's/early 90's. It now concentrates on the food side of things and serves lager that no-one else has ever heard of just like most other pubs in Sussex. It's also the ideal place to take your children on a Friday night if your idea of good parenting is forcing your child to passively smoke for 4 hours while you slowly get pissed with your friends. The Bent Arms has many other attractions including an antique steam driven spit roasting machine, a giant stuffed bear and a selection of wall mounted horse brasses. During the winter, If you're lucky, you may get to see a nice tender piece of rump gently being spit roasted in front of an open fire while a member of staff drizzles tenderising juice all over the glistening oiled flesh . They also serve fish. The only down side to drinking in Lindfield is the occasional gang of 'rugger buggers' singing like arses. If you wish to join them we suggest you adopt the standard uniform of comedy golf trousers, pullover, hat and glove. You will also need to hang a bar towel from the rear of your trousers presumably to clear up any spillage. Cuckfield has a few pubs, some of which have been visited by celebrities. Please see our dedicated celebrity section. Probably the most popular pub is The Wheatsheaf. Having recently been renovated in the bland style it boasts a dining area, 2 fruit machines, a TV and a jukebox. It is also a hotel and has been home to a number of famous people on more than one but less than three occasions. We went there one new years eve and were treated to complimentary wedged potato bites and chicken nuggets. There were only 8 other people there including staff. The Ship Inn has a nautical theme, which seems odd seeing as Cuckfield isn't near any waterway, coast or harbour. They used to hold pub quizzes every Wednesday, but we don't know if they still do. Cuckfield has seen one or two pub closures in recent years. 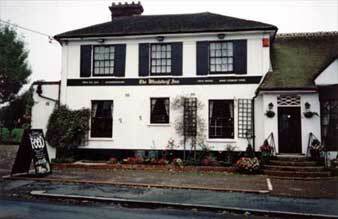 The King's Head was Cuckfield's answer to The Bent Arms in Lindfield and used to hold gigs. It also had a pool table in generous surroundings, a fair sized garden for the summer and a jukebox. The pub has since been converted into poncy flats. We've never been in The Talbot but we understand it used to be popular with pupils of Warden Park school as an alternative to games lessons. One thing to note about Cuckfield, if you like going to pubs and showing off your new mobile phone then forget it. Cuckfield is a black spot for all mobile phone signals. Haywards Heath has at least 6 off-licences within a 2 mile radius of the town centre and is the perfect town for those wishing to purchase alcohol for home or park consumption. At least one off-licence is situated near a roadside pedestrian barrier making it a convenient place for local teenagers to lock up their bikes prior to purchasing two cans of Stella Artois to share among thier friends. Haywards Heath has no night clubs. Many of the pubs mentioned have contraceptive sheath machines in their lavatories. Haywards Heath has literally tens of celebrity connections. If you know of any then mail us.